A home in Quincy’s Houghs Neck section, in March 2018. 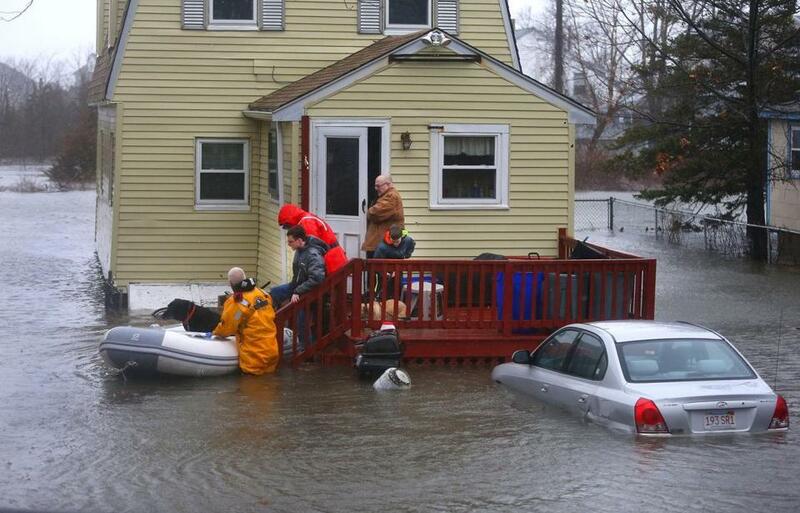 Rising seas have already cost Massachusetts homeowners more than a quarter of a billion dollars in lost property value, according to a study set to be published Tuesday, with much more severe losses likely to come. That’s according to the First Street Foundation, a New York-based nonprofit that studies sea level rise and its impacts on coastal communities. Its report estimates that the value of homes in Massachusetts has potentially been eroded by $273 million since 2005 because of concerns about flooding and sea level rise, with the biggest effects in low-lying parts of coastal towns, including Salisbury and Barnstable. Studies of changes in the sea level have typically looked forward, such as an estimate last year by the Union of Concerned Scientists that 7,000 Massachusetts homes, worth $4 billion, would be subject to chronic flooding by 2045. First Street says its study is the first one to estimate — based on data from nearby sales — the potential depreciation of property prices because homes and neighborhoods commonly face flooding from the sea. The nonprofit analyzed 11 million real estate transactions and found that would-be buyers are starting to factor flood risk into their offers, which has kept home prices from increasing at a faster rate than in the real estate markets in general in flood-prone areas over the last decade and a half. It has now issued reports in 14 states, estimating $15 billion in lost value nationwide. The study’s authors say they hope the data will bolster the case that cities and states should act now to adapt to rising seas, before more properties are at risk. First Street’s founder and executive director, former Weather Channel executive Matthew Eby, also used to run a separate nonprofit that has advocated for funding for sea wall projects in Miami and Virginia. In Boston, the Walsh administration’s Climate Ready Boston plan is studying how to best defend waterfront neighborhoods against rising seas. One property highlighted in First Street’s report is on Marginal Street in East Boston, which suffered storm surge flooding during last winter’s storms and which, the group estimates, would be worth twice as much if not for flooding. New developments and parks along Marginal Street are being designed to help keep flooding from occurring. That could boost property values, Porter said. But many of the hardest-hit communities included in the study are outside Boston Harbor, on barrier islands and low-lying marshlands that may prove harder and costlier to defend than the dense city waterfront. Regardless, Eby said, he hopes the report will spark more conversation about how Massachusetts can adapt to a future of rising seas.